Railpictures.ca - Michael Berry Photo: One of a handful of CN GP40′s to be modified for beltpack (i.e. 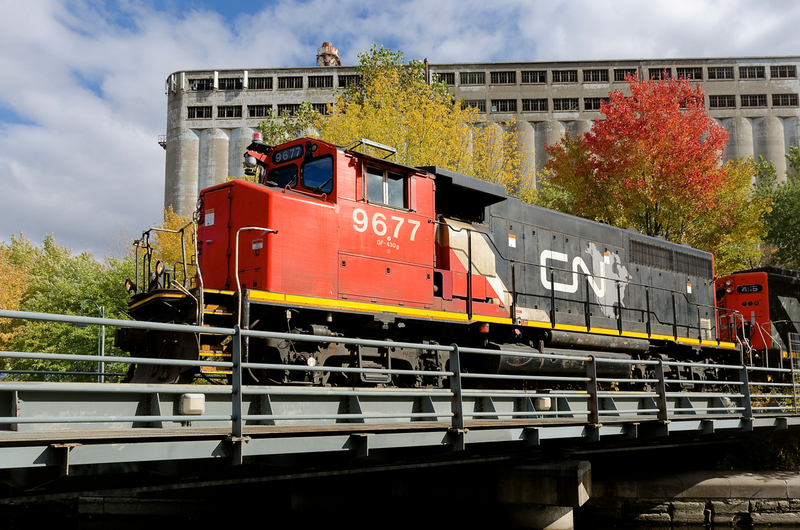 remote-control) use, CN 9677 leads the Pointe St-Charles switcher as it switches grain cars in front of the out of use grain elevator #5. | Railpictures.ca – Canadian Railway Photography – photographie ferroviaire Canadienne. Welcome Visitor. First time here? Like what you see? Bookmark us for when you are bored, and check out 'top shots' and 'fantastic (editors choice)' in the menu above, you won't be dissapointed. Join our community! click here to sign up for an account today. Sick of this message? Get rid of it by logging-in here. Copyright Notice: This image ©Michael Berry all rights reserved. Caption: One of a handful of CN GP40's to be modified for beltpack (i.e. remote-control) use, CN 9677 leads the Pointe St-Charles switcher as it switches grain cars in front of the out of use grain elevator #5. Click here to Log-in or Register and add your vote. @Brad..its a beacon just to let crews know that its operative and its location as a warning light. I’ve always wondered..is that what the beacon is for?